If you’re familiar at all with my story, you know that my voiceover coach, Alyson Steel, was instrumental in my advancing so quickly in the voiceover world. So I always recommend that aspiring voice actors work with a coach. That said, there are so many resources available now, that it is possible to start booking work without a personal coach. In fact, there are some very successful voice actors who have never had any coaching. 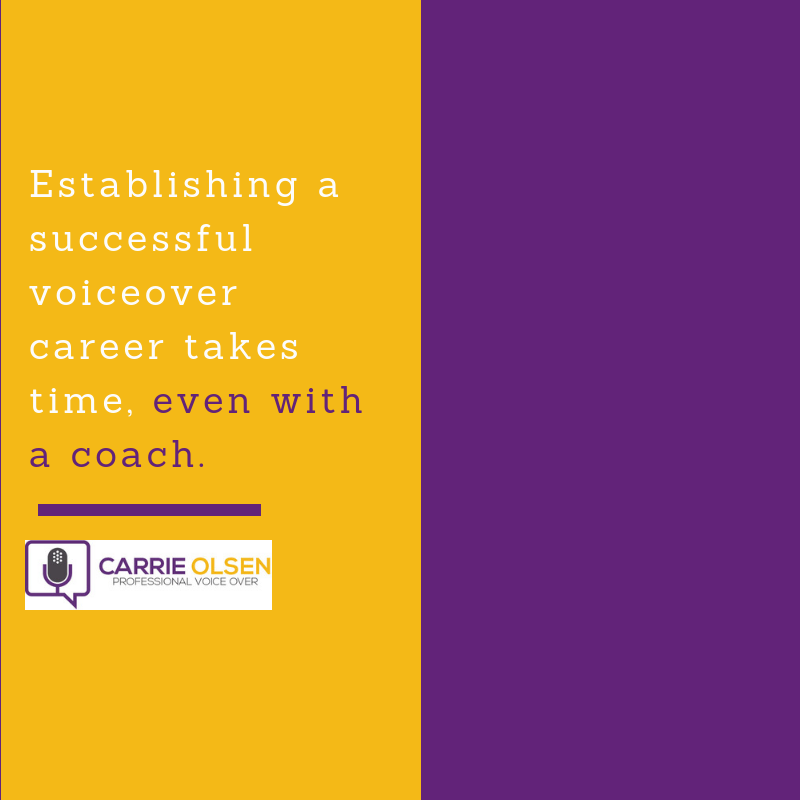 Establishing a successful voiceover career takes time, even with a coach. If you choose to go the non-coach route, you will need a lot of discipline, and you will need patience. An accountability partner or group will come in handy as well. I get asked frequently about how new VOs can get their feet wet without hiring a personal coach. So, here are some things you can do to help you do just that. Psst… If you work a full-time job, click here to get your hands on some Stealthy Study habits that I recommend for aspiring voice actors. They will help you get your practice in without sacrificing your other priorities. 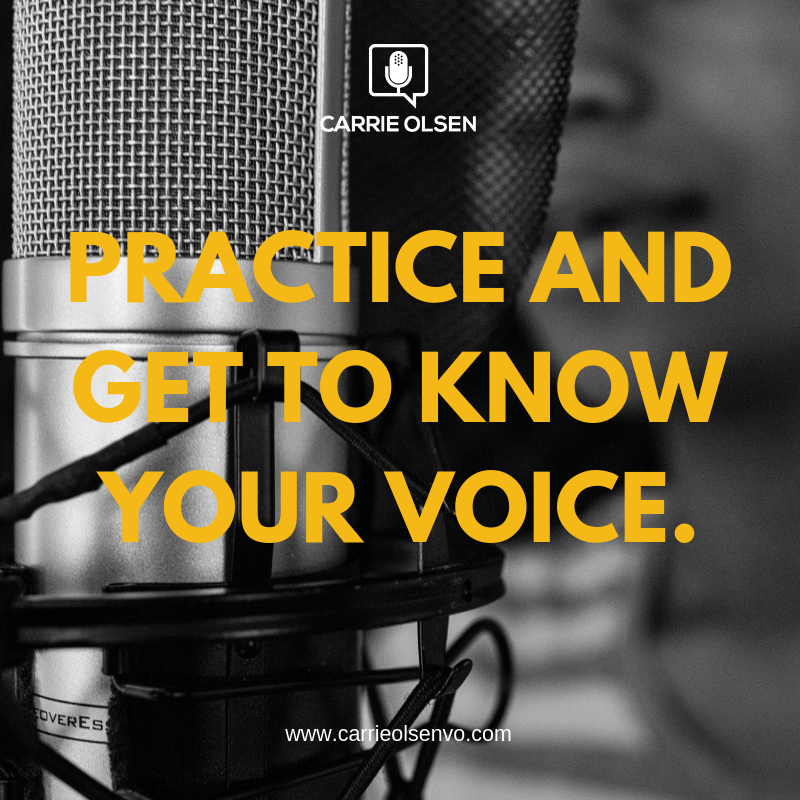 The most important thing you can do on your mission to break into voiceover is to practice and get to know your voice. To do this, pick up any kind of recording device — your iPhone, your computer’s internal mic, etc. — and just read. Billboards, magazine ads and radio/TV commercials all work great as practice scripts. Record yourself and then listen back. The most obvious aspect of voice acting is talking. But to be truly good, you also need to be a good listener. So make a point to start listening to commercials (or whatever kind of work you would like to voice). DVR programs, and fast-forward through the show to get to the ads. Change the radio station when the music comes on. Take note of trends or other things that you notice in the various mediums. How are TV commercials different from radio? Which spots do you relate with most and why? 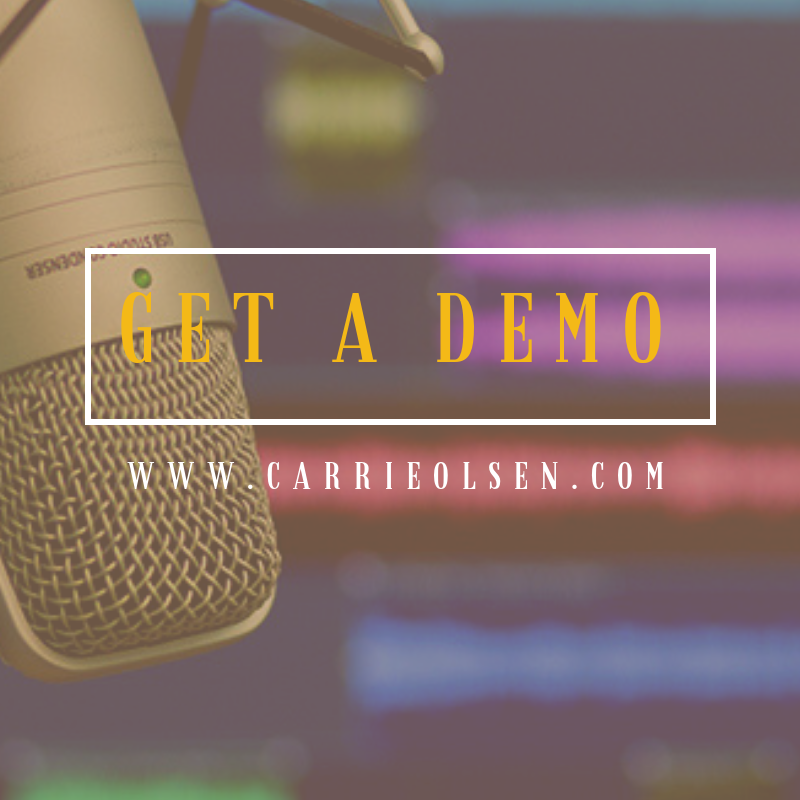 There is also a treasure trove of professional demos that you should be listening to regularly at voicebank.net. As you’re listening to commercials, e-learning, animation, etc., pay special attention to spots that you feel you can hear yourself doing. You may feel that you know where your voice fits into the VO world, and maybe you do. But I know that for me, and for most voice actors, it took some time to really get a feel for what my “wheel house” was. It is important for you to stay up to date on the industry, and since you don’t have a personal coach, you’ll want to utilize online groups and forums as much as possible to get advice, recommendations, feedback and answers to any questions you couldn’t find through research. I recommend some voiceover communities and forums here. I have learned so much from voiceover podcasts and books. There are great resources out there, so you should definitely take advantage of them. You can learn everything from mic technique to how to brand yourself to how to deal with agents. Some of my favorite books and podcasts are here. These days, you can buy a decent and affordable recording microphone on Amazon.com that will serve you just fine starting out. However, there are tons of them, and it’s hard to sort through them all to find exactly what you need. Do you want a USB mic, or an XLR? Condenser or dynamic? $10 or $2,000? For starters, you will probably want to use a condenser microphone, as they will pick up more warmth in your voice. Dynamics are less sensitive than condensers, but they’re good if your recording environment is less than silent. Let’s get into the equipment. By the way, some of these are affiliate links. They don’t cost you anything to use them, but they do help to keep awesome VO content coming your way! If you’re pressed for budget, you can go for a USB mic, but you’ll want to upgrade before you get serious about auditioning, and especially before recording any jobs. The Blue Nessie USB Condenser Microphone is a good buy for a good price. And the Blue Snowball USB Condenser Microphone is slightly less expensive, but is also lower quality. Another great studio quality USB mic is the Apogee MiC microphone. It is considerable more expensive than the Nessie and Snowball, but it is pretty close to studio quality. Adobe Audition CC is excellent. But it is rather bulky, and it can be buggy, especially if you run it on an older computer. Twisted Wave is beautiful, light-weight and easy to use. But it doesn’t do a lot of the more intense processes that Audition can — at least not right out of the box. However, it only works for Macs, so if you’re using a PC you’ll need to find an alternative. Audacity is an easy decision. It’s free, and it does absolutely everything you need it to. Your recording space doesn’t need to be world class. Chances are you can find a space in your house or apartment that you can easily convert into a home studio. It must be quiet (obviously). Really, this is the main consideration. If you can find a place quiet enough, you’re 90% there. Sound proof and sound dead. Sound proofing prevents sound from getting in our out. Sound deadening prevents echo and reverb within your space. You can purchase Acoustic Wedge Studio Foam for sound deadening and acoustic blankets for sound proofing. Or just hang blankets on the walls. Also, if you’re using a closet, clothes act as sound deadeners (deathers? diers?). Watch out for humming electronics you might not notice at first. Light bulbs, refrigerators, and even your laptop fan can sometimes be picked up by recordings. Even though you made it this far without a coach, this may be the step you want to drop some cash on. It will serve you very well to have a professionally produced demo to shop out to clients and agents. A good sound engineer will be able to make you sound your best, but ideally, your coach would advise you as to which spots to include on your demo, and perhaps even direct you as you read for your demo. If you’re a real DIYer, at least run your demo decisions by a group of trusted voice actors in one of the online groups or forums you joined. You can always book jobs through your own marketing efforts, but one of the fastest ways to get a lot of practice and experience fast is to join a pay-to-play site. My favorite for beginners is Voice123.com. You can also gauge how well you’re doing by watching for client feedback. Note which jobs you’re getting good feedback for, and when you start getting hired, note what kinds of jobs you’re booking so you can begin cultivating your voiceover brand. I mentioned using your own marketing efforts to get work. Really, this is something every voice actor should be dedicating at least some of their time to. There are many ways to reach out to potential clients. You can call up local car dealerships or other companies that you know produce their own commercials. You can call up production companies and media companies. Reach out to e-learning developers. And if you’ve got a killer demo, reach out to agents. Also, if you’re just interested in getting experience and are less concerned about making money, there are a lot of places where you can volunteer. I will caution you not to make a habit of giving away your voiceover services for free. It’s one thing to volunteer for a good cause or to gain experience, but it’s another thing to do free work for a company that should be paying you because you want the job. If you feel tempted to take a job that doesn’t pay because the company doesn’t have a budget or will just find someone else, consider whether they would ever propose such an offer to their other employees. Voiceover is a fun job, but it’s still a job, and it’s still work. Aside from volunteer opportunities, you deserve to be paid for your work. 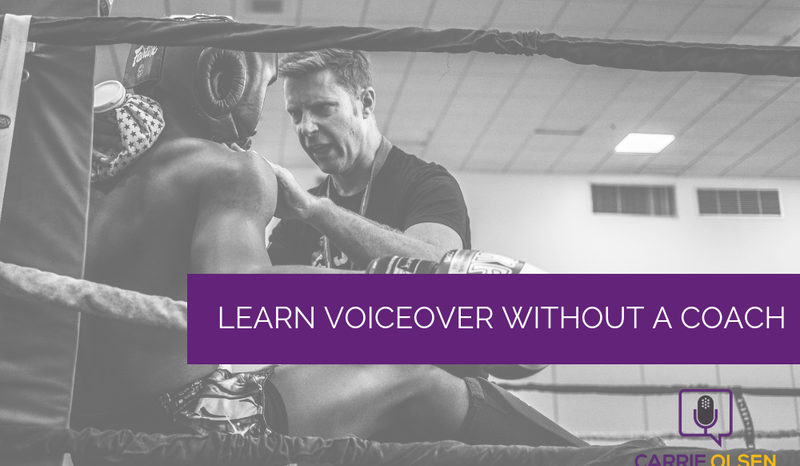 If you choose to go rogue and tackle the world of voiceover without a coach, I want to hear from you! Leave a comment to let me know you’re going to go for it so I can follow along with you. If you’re already in the middle of things, let me know how it’s going. Fill out the form below to get or stay on my email list, and get the Stealthy Study tips as well. I promise not to do anything weird with your email.